5 Polish books that got translated into English were named among the 75 best of the year. 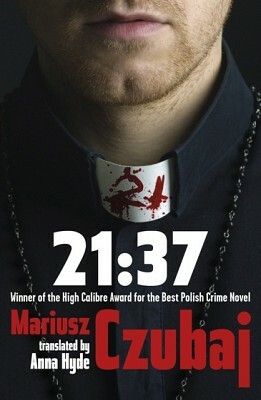 Mariusz Czubaj, 21:37 - Cover image. World Literature Today (WLT), University of Oklahoma's bimonthly magazine of international literature and culture, announced their annual list of “75 Notable Translations” which offer a collection of the year’s most exciting translations. WLT has been recognized by the Nobel Prize committee as one of the "best edited and most informative literary publications." The 5 Polish books whose translations made it on the list include Witold Szabłowski’s The Assassin from Apricot City (Zabójca z miasta moreli. Reportaże z Turcji, 2010), Tomasz Różycki’s Colonies (Kolonie, 2006) , Mariusz Czubaj’s 21:37 (2008), Jarosław Mikołajewski’s Froth: Poems (Zbite szklanki: wybór wierszy, 2010), and Tadeusz Różewicz’s Mother Departs (Matka odchodzi, 1990). Antonia Lloyd-Jones, who previously won the 2012 Found in Translation Award for best translation of Polish into English, translated Szabłowski’s The Assassin from Apricot City for the U.K. based Stork Press, which aims to give voice to writers from Central and Eastern Europe. Szabłowski’s book was previously nominated for the 2011 Nike Prize, Poland’s most prestigious literary award, and it won the English PEN Award 2013 as well as the European Parliament Journalism Award 2011. The book is a collection of journalistic reportages, drawing a polyphonic portrait of contemporary Turkey and evoking the present-day dreams and hopes of ordinary people. One of the most remarkable sonnet sequences of our time: the work of a wandering, restless, and moral mind, here rendered with clarity and vividness by the translations of Mira Rosenthal. Różycki has most recently participated in Hong Kong’s International Poetry Nights, and has been previously awarded the Kościelski Prize, known as the most prestigious literary prize for Polish writers under forty. Różycki has also been nominated twice for the Nike Prize. Colonies presents a collection of poems which take the reader on a sentimental journey to the country of childhood, dreams of pirates and distant lands. Piotr Florczyk translated Mikołajewski’s Froth: Poems, released by Calypso Editions. In this collection of poems, readers can witness personal moments from Mikołajewski’s life: his wife’s spine, his daughters’ playtime rituals, his father’s casket built from cardboard, or the yellow froth that lurks after he showers. Froth creates little moments of surprise through Mikołajewski’s keen techniques in wordplay. A unique mix of prose and poetry, of the joy of life and the agony of loss, in Mother Departs Różewicz creates a rich and complex portrait of his mother Stefania and of her indelible influence on her extraordinary family. Here is an artist attempting to give form, even meaning, to life – and death. Różewicz previously has won the Griffin Poetry Prize in 2012 and the European Prize for Literature in 2007. He is considered one of Poland's best postwar poets and most innovative playwrights. The 5 books and others as announced on WLT's "75 Notable Translations" are well worth exploring.